Here’s a project we don’t see every day! Luckily Mr Junk was up to the challenge. The Mr Junk team was taking care of a typical haul – removing an armoire, a dehumidifier, and an old ping pong table from a basement in metro Atlanta – when our customer asked for an add-on service. 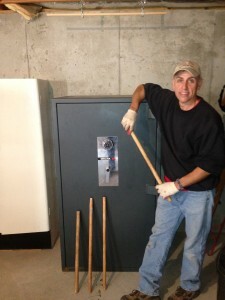 He had a 1200lb safe that he needed moved to from the basement to another room. It was a new one for us, but we were happy to oblige. Our team quickly chopped up some wooden dowels to use as rollers and pushed the safe down the hallway, weaving around corners to get the unwieldy safe tucked into to its new corner without leaving dents in any of the walls. It’s safe to say that we now know how the Egyptians felt rolling those huge stone blocks for the pyramids! Do you have an unconventional junk hauling job in metro Atlanta? Mr Junk offers superior junk removal and custom add-on services. Whether you’re getting rid of old furniture, donating sporting equipment to those in need, junking a dilapidated hot tub, or even trying to move a heavy safe safely down the hallway, we’ll do what we can to help you out for a great price. Just call Mr Junk and we’ll do the rest!